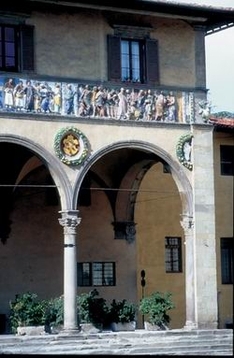 The main holiday in the city of Pistoia, located in Tuscany, Italy, is held annually on the 25th of July. The so-called “Bear Tournament” (Italian: Giostra dell' Orso) takes place on this day. The holiday got such a name as the knights were to strike a bear in the battle. However, the times when a real bear participated in the struggle are a distant past. Its back used to be covered with a red and black domino. The colors stood for the heraldic colors of provinces. Today knights have to strike a target which portrays a bear. To be honest, this task is also absolutely not easy. Especially considering, that unlike their distant predecessors who were professionals in military arts, the participants of the tournament become knights only for the time of the contest. The target which present-day knights are to strike is not tightly fixed, it is spinning, which greatly complicates the task. According to the rules, twelve knights take part in the “Giostra dell' Orso” tournament. Each district is presented by three riders. As in many other events of such kind in Tuscany, there are two tours in the “Giostra dell' Orso”. The feast begins with a parade, which moves around the streets of the city, sharing enthusiasm with participants and viewers of the tournament. About three hundred of people, dressed in medieval costumes, take part in the parade traditionally. The procession goes through the town hall's arch to the main square of the city, Piazza del Duomo, where the battle is held. Knights, by turn, strike the target in the form of a bear. Afterwards, the scores are counted and the winner of this year is determined. Besides, the most accurate knight is chosen. He receives the title of “Golden spear cavalier of Pistoia and neighborhood”. It is remarkable that the spirit of the medieval feast perfectly fits the city landscape of Pistoia. The “Bear Tournament” is a great chance to get acquainted with the traditions of medieval holidays in Tuscany and enjoy the beauty and distinctness of Pistoia city. The city of Pistoia appeared as a Roman settlement. The grand San Zeno Cathedral, which resembles an amphitheater and is an example of both roman and pisan styles, is located on Cathedral Square. The tomb of Chino da Pistoia, who was a poet and a friend of Dante, is in its southern nave.